Another stamp I picked up at the garage sale is from QKR Stamp-Ede. 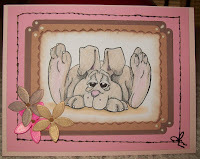 I'm in the middle of making Easter cards and this cute bunny was a "must purchase". I colored him/her with my Copics, scalloped the edges with my scallop scissors, and set it on Cramy Caramel and Close to Cocoa cardstock. I punch a corner scallop and adhered it to Pixie Pink set on Blush Blossom. I paper pierced the edge and did faux stiching with a freehanded bow on one corner. The flowers white table confetti by Gartner I found at Michaels. I colored the flowers and used 3-D paint for the centers.